I’m pretty confused why this is the case. Is it a backlash against Republicans for the government shutdown and debt ceiling brinksmanship? Maybe it simply reflects falling support for the Republican Party. Maybe from the Medicaid expansion? It’s surprising, given what a disaster the first couple weeks have been for HealthCare.gov. You wouldn’t expect the law’s popularity to be rising. Is this just a post-October 1st bump for Obamacare before the media began covering HealthCare.gov’s many major problems? Will support crater as the public hears more about it? I have no idea, but it’s an interesting and surprising dynamic. 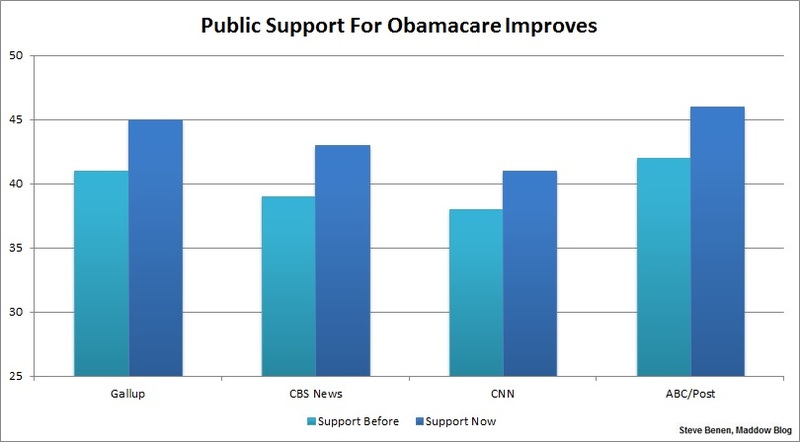 ‹ PreviousCould Obamacare’s Failure Lead to Single Payer?